Southern Brown Tree Frog. Image by Ian Moodie. The Southern brown tree frog is a common species found in great numbers in flooded grasslands or marshes. It is a small frog, growing to approximately 45mm long. The adults have pale fawn, cream, orange or light brown sides. It is an agile climber and jumper. Similar to other small tree frogs, this species is a voracious insect eater, capable of leaping to catch a fly in mid-flight. The males make a 'creeee creee creee cree cree' call. The Southern brown tree frog lives in trees, shrubs, and rock or log crevices on the ground or in damp vegetation. It is also comfortable under pot plants and woodpiles. It can be found in gardens in suburban Melbourne. It has been seen in Balwyn, Camberwell, East Kew and Kew. The Southern brown tree frog is endangered in Boroondara. It is threatened by introduced predators such as cats and foxes. They are also extremely susceptible to pollution in waterways as they primarily breathe through their skin which is a poor barrier to pollutants. We can help by not polluting our streets and waterways. To help with the preservation of the Southern brown tree frog, create a shallow pond with gently sloping banks and logs, rocks, leaf litter and shrubs to provide shade, shelter and protection. Keep cats in at night to protect frogs and tadpoles. Avoid using chemical sprays and insecticides. Allow the frog to move into your garden naturally. Striped Marsh Frog. Image by Ian Moodie. Striped marsh frogs are a large species of frog, growing to a length of 75mm. They have distinctive, alternating light and dark stripes on their body as well as a pale, narrow stripe down the centre of their back. They eat a variety of insects as well as almost any animal smaller than themselves, including other frogs. Their reproduction season is from August to March and tadpoles can be found all year round. The male frogs have a 'tock-' or 'poc'-like call. 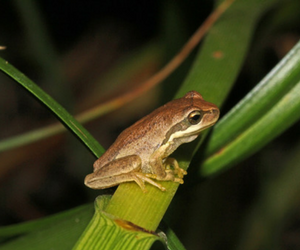 Striped marsh frogs live among wetland reeds and rushes in rainforests, open woodlands, farmland and urban wetlands. In Boroondara, the call of the Striped marsh frog can be heard in winter and spring emanating from Glass Creek in Hays Paddock, Willsmere Billabong and Back Creek in Camberwell. The Striped marsh frog is endangered in Boroondara, but secure in Melbourne. The Striped marsh frog is threatened by introduced predators such as cats and foxes. They are also extremely susceptible to pollution in waterways as they primarily breathe through their skin, which is a poor barrier to pollutants. We can help by not polluting our streets and waterways. 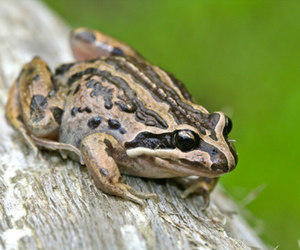 To help with the preservation of the Striped marsh frog, create a shallow pond with gently sloping banks and logs, rocks, leaf litter and shrubs to provide shade, shelter and protection.